Mango was launched on 30 October 2006, with bookings going on sale at midnight on the same date. Mango's first flight took place on 15 November 2006. Mango planned to join Star Alliance as a Connecting Partner in the third quarter of 2016 but the plan has been put on hold due to South African Airways' financial state. Mango is 100% owned by South African Airways, which is itself owned by the government of South Africa, but operates independently as a low-cost airline with its own Board and balance sheet. Financials for Mango are fully incorporated within the SAA Group figures. However, not all the performance figures in the Group's Annual Reports are broken down to subsidiary level (including load factors, staff numbers, etc. ); (in 2009, Mango's then-CEO, Nico Bezuidenhout, said: "I am not releasing our financial statements as that is sensitive information. We've always said we would report on the results and tell the taxpayer how we have performed. We have never promised to publish the audited financial report.") Some figures above are from press reports. 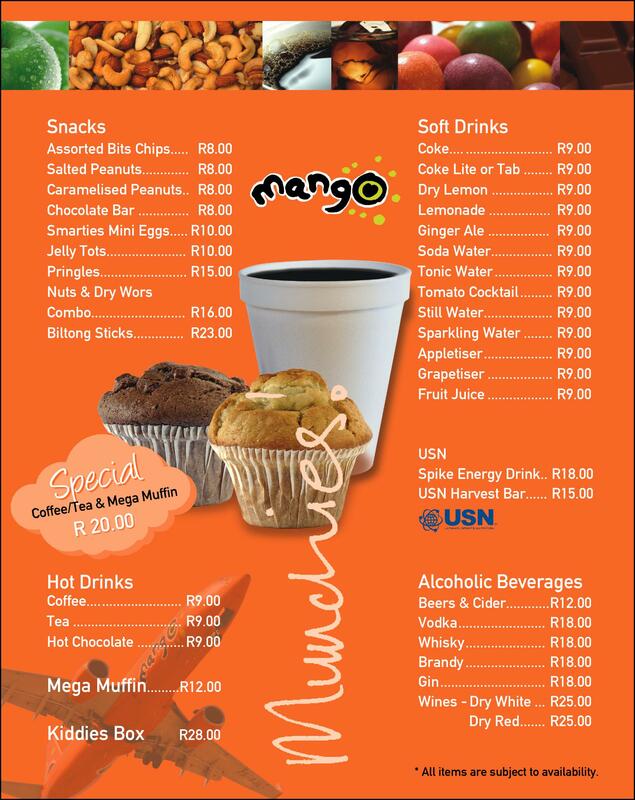 Mango's head office is at OR Tambo International Airport in Kempton Park, Ekurhuleni, Gauteng, on the mezzanine level of the Domestic Departure Terminal. Boeing 737-800 14 — 186 Former South African Airways aircraft. As a low-cost airline, Mango features a uniform fleet of aircraft with high seating density. Mango also offers online ticketing. A standard booking does not include food and drinks. 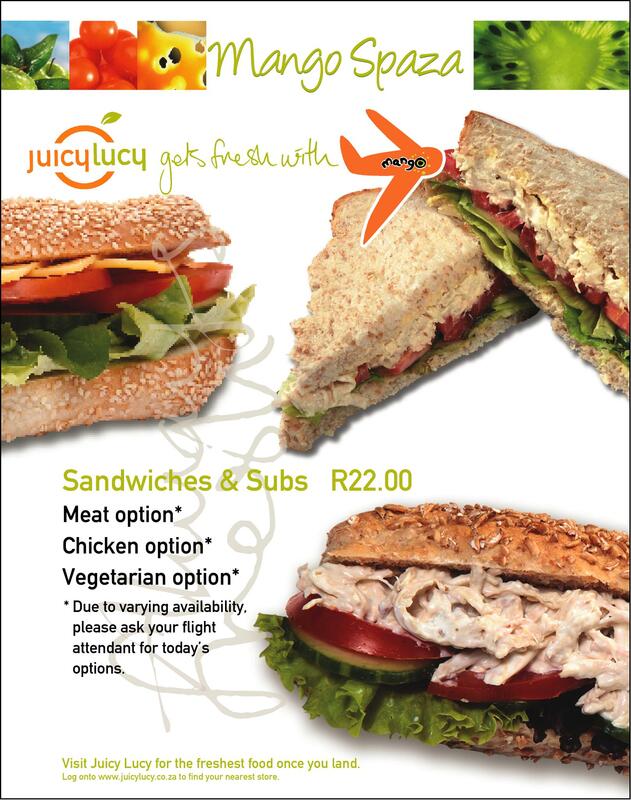 Mango offers a buy on board programme offering food and drinks for purchase. Mango provides an in-flight magazine Mango Juice along with Mango TV, a daily in flight entertainment programme viewable on the drop-down televisions placed throughout the aircraft. In-flight Wi-Fi is also available on all flights for a fee, except on ZS-VDB as this is an older aircraft. Wi-fi services are provided by G-Connect, a local internet broadband provider. ^ "Mango acting Chief Executive Officer appointed". 4 August 2016. Archived from the original on 17 November 2016. Retrieved 16 November 2016. ^ "Directory: World Airlines". Flight International. 10 April 2007. p. 47. ^ "Press - Star Alliance - Star Alliance". www.staralliance.com (in Japanese). Retrieved 31 August 2017. ^ "Directory: World Airlines". Flight International. 3 April 2007. p. 81. ^ a b c d e f "Statement by Minister Malusi Gigaba on Mango and the South African aviation sector". Retrieved 30 May 2012. ^ a b c d e "SAA Group Annual Report 2012" (PDF). Retrieved 13 December 2012. ^ a b "Mango financial results to 31 Mar 2009". Retrieved 30 May 2012. ^ "Mango Fleet Details and History". Retrieved 14 December 2012. ^ "SAA Group Annual Report 2013" (PDF). Retrieved 25 July 2014. ^ "South African Airways Group Integrated Annual Report 2014" (PDF). South African Airways. 2014. Retrieved 23 April 2015. ^ a b c "Financial performance 'not pretty'". Sunday Times. Retrieved 16 November 2016. ^ "Background[permanent dead link]." Ekurhuleni. 3 (3/8). Retrieved on 30 September 2009. ^ "Contact Us Archived 12 May 2013 at the Wayback Machine." Mango. Retrieved on 27 December 2011. "Mezzanine Level Domestic Departure Terminal OR Tambo International Airport 1627"
^ "Mango Airlines | Affordable South African Domestic Flights". Mango Airlines | Affordable South African Domestic Flights. Retrieved 31 August 2017. ^ "Spaza Mango 1 Archived 27 February 2009 at the Wayback Machine." Mango. Accessed 30 October 2008. ^ "Spaza Mango 2 Archived 27 February 2009 at the Wayback Machine." Mango. Accessed 30 October 2008. ^ "Mango welcomes Sixth aircraft to its fleet; live on-board TV planned". Flymangonews.co.za. Retrieved 30 May 2013.